BOSTON (AP) — The Boston Tea Party’s 245th anniversary is next month, but until Tuesday, the gravesites of the colonists who participated in the protest that helped spark the American Revolution have never been noted with any sort of special marker. They were placed in four of the city’s oldest and most famous cemeteries, including the Central Burying Ground; Copp’s Hill Burying Ground; the Granary Burying Ground; and King’s Chapel Burying Ground. Among the gravesites marked were those of the Bradlee brothers — David, Josiah, Nathaniel and Thomas — and their sister, Sarah Bradlee Fulton. She is known as the mother of the Boston Tea Party and is credited with coming up with the idea of disguising the men as Native Americans, according to the museum’s website. The image on the markers was inspired by Nathaniel Currier’s “The Destruction of the Tea at Boston Harbor” lithograph created in 1846. They will remain on display until the end of the year. 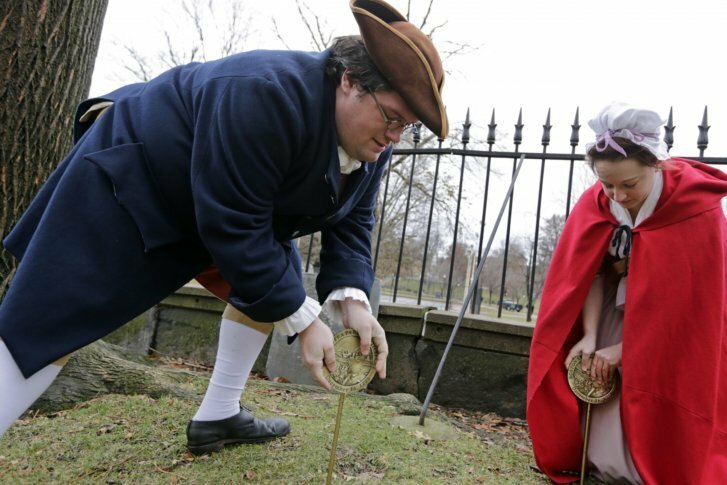 In the future, organizers said they hope to place commemorative markers at the graves of Boston Tea Party participants buried throughout New England and the United States.